I have mentioned before that just as a woman desires to feel loved, men equally desire to feel respected. Respect, in all forms, speaks volumes to men and often results in them feeling worthy of their wife’s affections. As you can imagine, talking about this with my husband stirred up some really important conversations between the two of us and I’m really glad that it did! Sometimes we can be so blinded to our own shortcomings that we have to take the time to ask our spouses to boldly and lovingly share them with us. Do you ever use your moods to control your husband’s response? For example: Have you ever responded curtly with, “Nope. It’s fine. I don’t care” – when it actually isn’t fine and you do care? 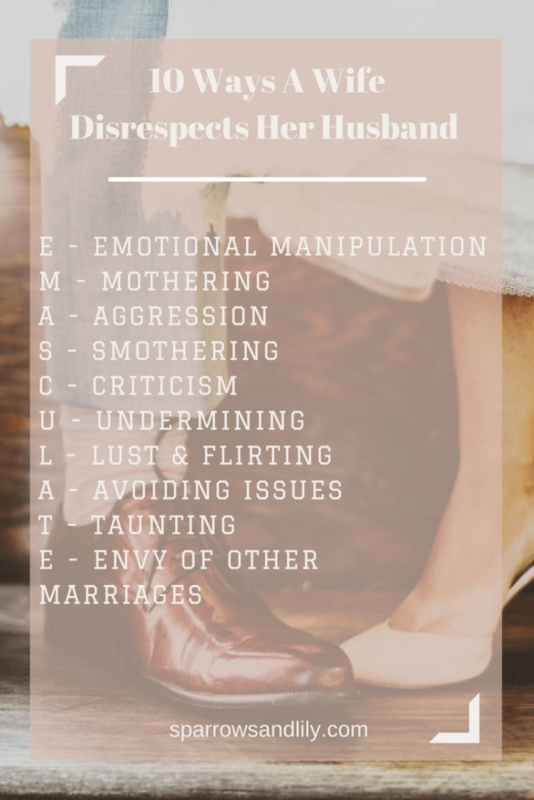 Guilt trips, using the words “always” and “never”, aggression or passive aggression, the silent treatment, doling out ultimatums, crying for pity or exaggerating disappointment are many of the ways that women emotionally manipulate their spouses. Friends, I want to encourage you to use your words. Be honest in the disappointment or sadness that you feel – nobody is telling you to suppress your emotions – but there is a boundary in knowing what you are saying to help your marriage versus what you are saying to control your marriage. Okay guys, I can be such a mom – in every sense of the word. But gosh, it’s damaging, and especially to my marriage. We have gotten to a place where I have recognized that this is a struggle for me and am actively choosing my words & actions more wisely, but that hasn’t always been the case. And I believe in many marriages, the wife acts like her husband’s mother, but because she thinks that it’s what’s ‘best’, she avoids the issue and drains her husband of all independence and joy. If you are regularly telling your husband what’s best for him or making your own convictions his convictions, it’s likely that you’re playing the role of ‘mom’ rather than the role of ‘wife’. This tends to make a man feel smaller and smaller in his role as your protector. Using aggression as a means of fighting or getting our way won’t ever allow our husbands to win. If he responds with meekness or silence, we make him out to be a coward. If he responds with anger, we make him out to be a bully. If you need space after an argument because aggression tends to be your go-to, then take time away before you come back together. ‘My dear brothers and sisters, take note of this: Everyone should be quick to listen, slow to speak and slow to become angry, because human anger does not produce the righteousness that God desires.” (James 1:19-1:20). Jesse and I have an ‘open phone’ policy and over-compensate when it comes to asking hard questions and telling hard truths. However, there comes a point when ‘openness’ becomes ‘obsession’ and ‘asking’ becomes ‘smothering’. I have always said that if either party in the marriage truly wants to go out and have an affair, there’s no amount of snooping that anyone can do to stop it. But even more importantly, you should fight for your marriage. If you struggle with trust issues, don’t smother your husband with prying questions to make him feel as if he’s done something wrong, only because you assume he has. First – pray for his heart and entrust him to God. Secondly, step out and speak to a couple or counselor who would be willing to hold both of you accountable and to help you walk through the trust issues that you face. This one speaks for itself. If you spend the majority of your time criticizing the things that your spouse has done wrong rather than praising the things that they have done right, it’s likely that they feel as if they won’t ever be good enough for you. Your words have the power to destroy or build them up. Challenge yourself each day to voice ten positive things about your husband for every criticism you give. This is a big one in a lot of marriages. Undermining your husband, especially as a father, teaches your children that he is not competent and shouldn’t be respected. Overruling his decisions in front of your children not only teaches them to disrespect him, it brings discord and conflict into your home rather than bringing peace and unity. We are on the same team and any time we think that we’re doing the ‘right thing’ by devaluing our husband’s words or opinion, we are slowly giving no other option but for him to disengage and completely leave the parenting duties to us. This should be an obvious one, but a woman who either secretly or openly flirts with other men has the ability to immediately make her spouse feel ‘less than’, ashamed and embarrassed. When we married our spouses, they became our only ‘type’; you are your husband’s and he is yours. Talking about other men or hinting at the attractiveness of other men is degrading and disrespectful to our husbands and creates insecurity in their hearts. Holding grudges and keeping a record of your husband’s wrongs, rather than talking things out and expressing what’s really on your mind, will likely lead to bitterness and resentment on both ends. If you continue to allow bitterness to fester in your heart, you will bring up past arguments when new situations arise, causing your husband to feel as if there is never any progress made. Do you provoke your husband? Do you push his buttons for the sake of attention or to test his response? Do you nag at him when he walks in the door for not helping enough around the house, even though he has worked a 40/60/80 hour week? A taunt is defined as, “a remark made in order to anger, wound or provoke someone.” We would probably never openly admit that we ‘taunt’ our husbands, but think back to the comments made the past few days – were they meant for building up or for tearing down? Contentment is huge. And when we display discontentment in our lives, our husband immediately feels the need to ‘fix, fix, fix’ until he feels like there’s nothing more that he can do and he just wants to give up. The more time and energy we waste comparing our marriages (or husbands) to that of other people, and telling him who he isn’t or who he needs to be, the more we miss out on the beautiful quirks and gifts in the person that God gave to us.